Some good news for coral reefs: In 2014, President Obama expanded the Pacific Remote Islands Marine National Monument in the central Pacific from about 87,000 square miles to 308,000 square miles. The Monument “is the largest marine protected area in the world and an important part of the most widespread collection of marine life on the planet under a single country’s jurisdiction,” according to the National Oceanic and Atmospheric Administration (NOAA). Fishing, energy exploration and other activities are prohibited in the Monument. Among the Monument’s protected corals are expansive shallow coral reefs and deep coral forests, including some corals that are 5,000 years old. In the accompanying video, Paul Sikkel, of Arkansas State University, discusses some of the possible successes of the MPA system in the Philippines. 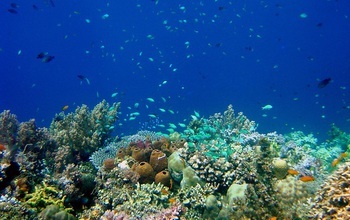 This system was developed back in the early 1970s, when reef fisheries were left virtually unmanaged, and destructive fishing practices, often organized by large commercial fishing companies, ran rampant throughout the Philippines–a cluster of 7,107 islands that harbors more than 1,700 reef species and about 9 percent of global coral reef area. To help protect its marine resources, the Philippines established at least 985 MPAs covering almost 5 percent of coastal municipal waters. To a large degree, the Philippine MPAs are now co-managed by local communities and local governments along with the national government. This partial de-centralization of authority helps give responsibility for MPA management to those who depend on their ecological health the most: coastal communities. The Philippine MPAs still fall short of the national goal for coverage area, and conservation enforcement problems remain. Nevertheless, some evidence suggests that the Philippine community-based management system may have generated some conservation victories. For example, a study published in 2010 showed that species richness of large predatory reef fish increased fourfold over a 14-year period in one Philippine MPA and 11-fold over a 15-year period in another Philippine MPA. The study also showed that as species richness increased in complexity within one of the MPAs, this type of complexity also increased within neighboring fished areas–evidently because of a spillover effect from the MPA.